Nervousness over Iran's nuclear program is boosting gasoline prices, even in this well supplied market. But if Iran is attacked, gas prices could shoot above $5. NEW YORK (CNNMoney) -- Tensions with Iran are adding at least 30 cents to a gallon of gasoline in the United States, and experts say gas prices have only just begun to rise. Gasoline prices have surged over 10% in the last two months, largely tracking the runup in oil prices, which have increased by a similar amount and are now at a 9-month high. Several factors have caused oil prices to rise, including the sense that the economy is improving and supply disruptions in a handful of minor oil producing nations. But the biggest factor by far, say analysts, is fear that tensions with Iran will lead to an all-out war that causes a disruption in oil supplies. "The market right now is fairly well supplied," said John Kingston, director of oil, at the analytics firm Platts. "You've just got a significant fear factor that things could get worse." Kingston noted that OPEC is actually producing more oil right now than is needed to keep pace with global demand. As such, stockpiles are rising. And thanks to the recession and better fuel efficiency, gasoline demand in the United States, the world's largest consumer, is actually the lowest it's been in a decade, according to the Energy Information Administration. Yet gas and oil prices continue to climb. The fear is that Iran's 2.2 million barrels a day in exports could be cut off. Iranian oil is already being sanctioned, but so far most is still finding its way to market, just at lower prices. Worse, there's fear the 17 million barrels a day that flow through the Strait of Hormuz, one fifth of the world's total production, could be disrupted by an Israeli attack. That's a big reason why gasoline prices in the United States averaged $3.37 in January, the highest for any January ever, according to AAA. "It's a market that's caught fire," said Ben Brockwell, an analyst at the Oil Price Information Service, which collects data for AAA. "And it doesn't look like there's any circuit breakers to stop it." Indeed, Brockwell noted that while retail prices are up 36 cents a gallon in the last two months, futures prices have risen even higher -- 82 cents over the same time period. Unless the situation with Iran cools off and future prices decline, consumers will likely see that 35-cent-a-gallon difference in the form of a similarly paired price hike at the pump in a matter of weeks. "I definitely think the market is psyching itself up for a new record," he said, referring to the previous average high price for gasoline, which was $4.11 a gallon set in the summer of 2008. "Probably before memorial day." That possibility has got a lot of people freaked out. Everyone from the Obama administrations to the American Petroleum Institute has been trying to talk down prices in the last few days. Many economists say gasoline prices sustained above $4 a gallon could stunt the growth of the fragile worldwide economy -- a fact which diplomats shuttling to Israel must be well aware. It's thought the Israelis are considering an attack on Iran as a means to disrupt its nuclear program, which Iran says is for peaceful purposes but many suspect is intended to produce a bomb. But if Israel can't be persuaded to hold off an attack, $4 gas will look cheap. 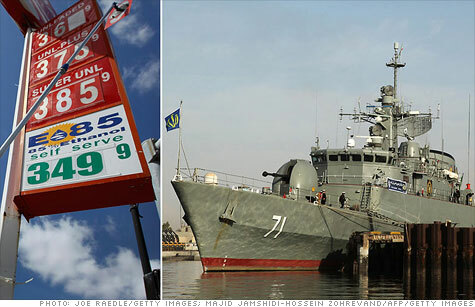 "If Israel does hit Iran, all bets are off," said Mike Fitzpatrick, editor-in-chief of Kilduff Report's Energy Overview. "$150 [oil] is the first marker we'll hit." Oil at $150 a barrel could translate into over $5 a gallon at the pump.